It is comfort food for the body, the soul. The nubs and knit one pearl two’s. Knit in love by hand by many. By hand somewhere, perhaps, in the glorious imagination. I know she knit, she knitted, she still knits. So that is what I see in the eyes of the mind, the heart. Not the factory woven ones. I pretend they are each created by the hands of mother, women with love. Birthed by hand. 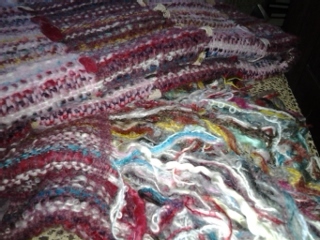 Birthed on a lap, in love with each spectacular skein feeding the woven art. Twisting threaded tendrils turning the corner, row on row. The colors mark the masterpiece like a box of Crayloa’s, sixty-four times tenfold or more equals a sea of blended, love. The colors bleed, each row into the next. The love bleeds into each loose or taut loop of yarn, over and around they twist, over needle, round the corner to the finger, worn out working, in love. Love looks like nubbies. Love feels like threads, soft or silken. Knit with care. To me. A sweater knit by hand. With care. Time invested in each row, warmed by lap. I see her sitting with the tools to make the throws or scarves or sweaters. Woman weaves her wearable art. Woman weaves her warmth. Creates a vehicle for a body. Warmth to hold the heat that stokes the life. Its love. She makes the woven shield, to block the elements of life, guard against the cold life winds. She knits one and pearls two, more to make body armour. Protection for her family, the one she loves. It wraps around the body, hungry for her art. Of her hands. Comfort food to warm the flesh and bones that she birthed, with woolen woven, love. What woven woolen warmth she creates, breathing love and making love. And warms her family with the tedious movement of the threads, of love. Each movement of the needle brings the yarn to form another row of woolen love. A covering for her precious. A sweater. Comfort food to feed the weary soul. An archive of her love, her art for years to come. The quilt, the needlepoint, cross-stitch and all created beauty of her hands. A sweater, shorn from sheep she shapes her love onto her flock and forms, love. 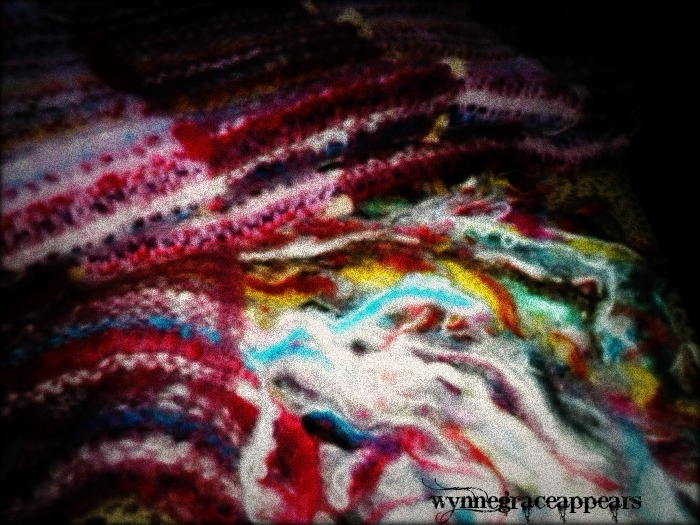 Wrapped up in woven wooly work of women, a sweater made of love. I’m at Amber’s today with this Sweater piece. You really will love it there. Come read and wrap up in words over there. I love these women, this woman shaping love onto her flock. I love how you touch on the universal, the individual. Act by act, row by row, knit love — love that is time, effort, protection and provision. Lovely, friend. Thanks Ashley, this is some warm and wooly fun over at Amber’s. I love it. You encouragement me in such a cozy way. And you hear me. How warm is that. Its all toasty over there. And I am so looking forward to THE FROST. And thanks for hearing my heart so very clearly. Danelle, thanks friend for seeing and hearing my heart. It means the world and so do you to me. Love writing in community with you. So much to learn in sharing. Good to see you here today. I have so enjoyed reading all of our thoughts about sweaters and just meeting up with you all again. Kim, love these moments in community at Amber’s. Hoping for you all sorts of wonders in your weekend wanderings. I love seeing your face over here. It is a rich blessing.